This polystone collectible is hand finished and painted to the highest standard, and comes with a textured base that features the logo, edition size and artist signature. Click here for more details. Ok folks, ZED #6, is currently soliciting in April's Previews (for items shipping in June). I really need to get the numbers up on the series so please help spread the word and make sure that your comic retailer orders lots of copies NOW! ZED #6 is featured on page 310 under GAGNE INTERNATIONAL PRESS. I have posted a five page preview to tantalize you. Check it out by clicking here! Previews, for those who aren't familiar with it, is a giant monthly catalogpreviewing all the comics, graphic novels and pop culture merchandise available from your local comic book specialty retailer, approximately two months in advance. A few weeks ago, I did a lecture at Vancouver Film School. It was a very fun event and the students seemed to really enjoy it. I thought I'd share this really nice article about my visit that was posted on the school's website. There's even a video of me babbling some nonsense! 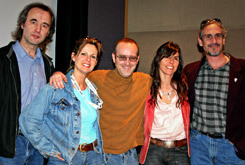 People on the picture are (from left to right): Dieter Mueller, Anne Denman Wilde, Michel Gagné, Myriam, and Joseph Gilland. 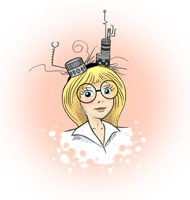 Here's a pinup I did for my pal Phil Foglio's series, "Girl Genius". I met Phil a few years ago at the San Diego Comic-Con. He was wearing a long white coat with a badge that said "pornographer". Intrigued, I went to his booth to investigate and found that, indeed, Phil has dabbled into the realm of X-rated comics. Let me also add that those naughty comics only represent a small fraction of Phil's opus. He is a highly productive and talented artist. Check out his wonderful work at his official website, www.airshipbooks.com.